Question - What do you mean by marketing competitiveness? How the marketing competitiveness can be improved? Whatever product a marketer has to offer in the market, one thing is sure, it's going to get competition. It depends on the product type and marketplace what degree of competition it'll get. 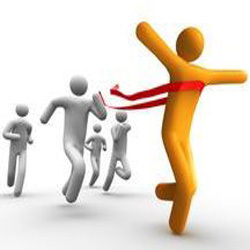 For the success of any business it is necessary to compete effectively with other businesses. The best way to mitigate competition is to develop marketing competitiveness. Marketing Competitiveness is the ability of an marketing organization to deliver better value to customers than competitors. A universal and exact definition of marketing competitiveness does not exist. Competitiveness means different things to different organizations. Some marketers view marketing competitiveness as the ability to persuade customers to choose their offerings over alternatives; while others view marketing competitiveness as the ability to deliver better values to customers than competitors. "Marketing Competitiveness is the ability of a business to improve continuously marketing process capabilities and deliver better value to customers than competitors." It is the ability of a business to add more values for its customers than competitors and attain a position of relative advantage. It leads to a situation where a business has an advantage over its competitors by being able to offer better value, quality, and service. Customer values are the combination of several benefits offered for a given price, and comprises all aspects of the physical product and the accompanying services. Customer values - Customer values should be viewed not only in terms of product characteristics, but also in terms of processes which deliver the product. Both the product and process concept have to be right to achieve customer satisfaction. Identify and Promote USP - Unique Selling Proposition is something that sets a product apart from its competitors in the eyes of existing customers as well as new customers. Marketers are required to identify USP of their product and effectively communicate it with the target audience. Cost efficient operations - Business is required to be organized and operated efficiently, so that the cost of production and distribution be minimized. Customer delight - Business organizations must provide proper customer services to delight its customers. The above points can lead a business to a situation where it has an competitive advantage over its competitors by being able to offer better value, quality, and service.